Anyone who's trying to change their diet has heard--or learned--that one of the most basic and effective ways to break entrenched eating habits is to write down everything you eat. Not only will you get an idea of how much you cram into your snackhole on a daily basis, you'll get a decent idea of how many calories you're taking in daily. Red Alert: Calorific Lite breaks down the foods you eat by color—green foods you should eat in abundance, yellow you can enjoy in moderation, and red foods should be a rarity. While the act of recording what you put in your mouth can be a great reality check ("I had no idea I ate that many Snickers bars in a week") or an effective deterrent ("Do I really want to write down that lunch was 'a bag of Doritos? '"), it can also be a real pain. While the iPhone does not lack for calorie-counting, food logging apps, many of these require a lot of tedious searching; worse, some of them require you to look up the nutritional information and enter it into the app yourself. And one of the most frustrating features of nearly all the food logging programs is that they're often not equipped to handle "compound foods”—salads, soups, casseroles or sandwiches. Calorific Lite from WorkSmart Labs sidesteps those hassles, making it an excellent tool for those of us who want to improve our behavior with a minimum of inconvenience. Here's how the free app works: Instead of striving for precise caloric values attached to each food, Calorific splits foods up into three general categories: green, yellow and red. Green foods are the ones you can eat these in abundance (vegetables, whole grains, and so on); yellow foods are the things you should eat in moderation (dairy, lean animal proteins, and such); red foods are the ones you should eat only a little of (butter, steak, etc.). As you eat a meal, you look at item, figure out if it's a green food, a yellow food or a red food, then enter a portion size accordingly. If you've got a compound food--a club sandwich, for example--you'd log the lettuce and tomato as one portion of a green food, the slices of bread as two red portions, the turkey as a single green portion, the mayo as a red quarter portion. Calorific will attach a calorie value to each green, yellow or red portion--for example, eating "a bucketful" of broccoli for lunch one day netted me 150 calories of a green food. The app then creates a pie chart showing you the percentages of your calories that are coming from green, yellow and red foods. The great thing about assigning a fixed numerical value to a food by color category and portion size is that you don't have to bother looking up a lot of specific nutritional information; you just eyeball your plate and figure out what size each portion is and under what color the food would be categorized. The visual representation of how you're allocating your calories is sobering: On the same day I had my bucketful of broccoli, I had also had a McDonald's breakfast combo, and that 40 percent of my pie chart glaring red all day felt like a chastisement. I've avoided the (delicious) sausage biscuits since. Using Calorific was a little slow for the first few days. Until I had a firm grasp of which foods fell into which categories, I was typing in my choices, and that gets old. In addition, I couldn't understand the star ratings the app assigns to your daily pie chart: Why did the day where my calorie ration was 71 percent green foods and 28 percent red foods rate lower than a day where the ratio broke down to 47 percent green foods, 43 percent yellow foods and 8 percent red foods? 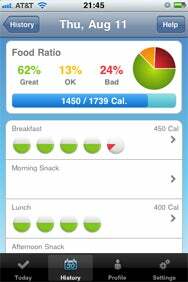 It wasn't until I visited the app's FAQ online that I learned Calorific has a built-in caloric ratio in mind for its users: 50 percent of one's daily calories should come from green foods, 35 percent from yellow foods and 15 percent from red foods. The inconsistent support for the application is another head-scratcher. When I accessed the app's FAQ via the app itself, the hyperlink loads a fairly detailed document that lists the company's rationale for sticking different foods in different color groups. However, this link was nowhere on the site when I tried to access it via my browser. Instead, I got a two-question FAQ about using the app. Another drawback to this application: You can't customize it to accommodate specific dietary practices. Anyone who's trying to pay attention to foods with high or low glycemic index (GI) values might find it sketchy that the app treats a serving of watermelon (GI value: 4) as the equivalent of a banana (GI value: 13). And folks on high-protein, low-carb diets might not enjoy getting zinged for their abundance of yellow- and red-food choices. Still, if your goal is simply to become more aware of what you choose to eat, and to nudge yourself toward defaulting to healthier eating, Calorific is a great, low-fuss tool for helping you toward that end.